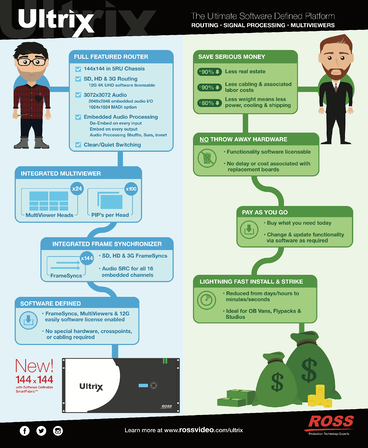 What’s the right move – IP, SDI, or a hybrid solution? While IP promises increased utilization, scalability, and flexibility, it can also add complexity and risk. IP is well suited to spin up a new online channel in the cloud with pre-recorded content from a file server. However, until IP’s latency, processing, and I/O bottleneck challenges are addressed, it is much less feasible for live productions. So, the question around IP is more about when, and for what application. And the answer lies in your workflow, not the signal transport. Every organization is different, and every one of them has a different workflow that fits their unique style. Unfortunately, not all products on the market reflect this truth as they try to force one standard workflow upon users. This recognition led to the development of products that provide flexible workflows and is at the heart of Software Defined Production, or SDP. A better question to ask might be: is there anything hindering your workflow, and if so, how can you achieve your ideal workflow? SDP may be an acronym which you have seen floating around the industry. It stands for Software Defined Production, and Ross and others have been using this term to refer to products that enable users to implement flexible broadcast workflows using equipment that can be pooled and repurposed with agility and scale – a fancy way of saying that SDP products are not single-purpose hardware, but a product which can be customized to your specific needs merely by the push of a button. Hmmm…. Doesn’t that sound a lot like the pros of IP, without the cons? SDP and custom workflows sound nice, but why is SDP more important to consider than the IP/SDI conundrum? Because SDP can help you solve real challenges facing all aspects of your business right now! 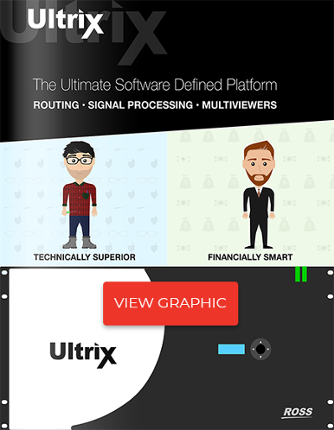 Let’s look at the latest version of Ross’ software defined routing platform, the Ultrix-FR5, as an example. All areas of an organization have unique problems to address. With the flexibility of SDP, leaders of each section can achieve their goals. Users are happy to loosen restrictions and work in the manner that suits them best. Technical staff are delighted at the reduced hassle in trying to maintain and install an SDP device. The business side can benefit from the cost savings inherent in SDP products. The reason Ross and others are so excited about SDP is that the benefits outlined above are not only limited to Ultrix: they are inherent in all SDP products. SDP products' flexibility lets them satisfy multiple areas within a business. Finally, I would like to end this post with a big thank you to Ross’ resident SDP aficionados Nestor Amaya and Todd Riggs for their input. You can find a recently recorded webinar here where Nestor and Todd take a deep dive into SDP and explain its benefits with a technical focus.